Welcome to The Abso!ute Sound online! We explore music and the reproduction of music in the home. We believe that the sound of music, unamplified, occurring in a real space is a philosophic absolute against which we may judge the performance of devices designed to reproduce music. Our goal is to provide the resources consumers need to judge how a component's sound either honors or departs from the music's truth, and to make sound purchasing decisions that maximize their experience of reproduced sound. Below is our Issue 231, March 2013 table of contents and editorial. The venerable British loudspeaker-manufacturer creates a stunning $1499 monitor to celebrate its 50th anniversary. Neil Gader reports. New TAS reviewer Vade Forrester on a highly capable mid-priced DAC that gives us a hint of the future of high-resolution DSD playback. The Canadian electronics company celebrates its 50 anniversary with this 135Wpc integrated amp. Kirk Midtskog has the details. Steven Stone looks at three new USB converters. Robert Harley is floored by this ultra-quiet, ultra-detailed, and ultra-musical phonostage from always-reliable Simaudio. Greg Cahill surveys the brilliant career and polymorphous output of one of the most independent, inventive, and original musicians of our time. Alan Taffel reviews recent hi-res downloads of classic rock albums. Neo-soul from MeshellNdegeocello and Macy Gray; neo-country from John Hiatt and Greg Brown; neo-folk from Tim O’Brien and Darrell Scott; neo-world music from Taarka; neo-hip-hop from MC Yogi; new blues from Darren Jay & the Delta Souls; and (really) old blues from Cin-city. Sterling performances of Fauré, Bach, Britten, Finzi, Ciurlionis, Mortensen, and French Flute Favorites. New releases from Wayne Shorter, Jason Robinson, and Chris Potter; in-concert recordings by Magico and Keith Jarrett rescued from ECM’s vaults; and Gil Evans’ Out of the Cool on 45rpm vinyl. Greg Cahill on five great albums by notable post-2000 neo-soul artists. 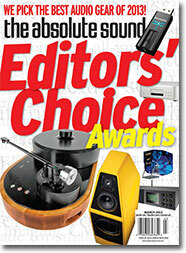 Neil Gader talks with Greg Stidsen of NAD Electronics and PSB Speakers.